The separation of knit and life. My adventures in knitting and my noble goal of avoiding all housework. What are you still doing subscribed to or reading this place? It's dead. It's gone. It's no more. The new blog is at http://picnicknits.com/ - yes I've been there for awhile. C'mon over! Come and see me here. I know, I've been a horrible blogger. But I have discovered the secret to finishing projects. Wait for it... You pick one project. You work on only that project until it's done. It's a sucky secret I know, but it's working for me. There's been others too, but my picture software is giving me gas. Right now I am working on a lace cardigan in cotton fleece. It needs a name. Must finish it before I move on to something else. And yes, I've been drinking the Ravelry kool-aid. I'm rincaro over there too. Come friend me! It was a good idea. I have four sweaters that are like 75% done. So I finish one each week in January. I was in the homestretch on the Sandy Cardigan. All I need was half the edging and half a sleeve. I'm running out of yarn. I'm in negotiations on Ravelry to get a smidge more. Mind you, I already eliminated the collar in anticipation of this. The pattern lies. Or is misleading. I don't know. It's late and I'm tired. So I move onto Juliet. And decide to try her on. She's too big. And considering that I'm the biggest I've ever been, she ain't gonna fit. I will not grow into her. And yes, I've tried her on before. I don't know. She gained weight with me? Who knows. So now I'm down to two sweaters that are about mostly done. Mr. Greenjeans and Tomato. Both of which are too small right now. But it's the new year. A good time to walk, and eat healthy, and knit sweaters that are too small? Geesh, I don't know. The more I type it out, the worse of an idea that it seems. What I really want to do is cast something on. Something easy, something happy. But that will kind of mess up my happy finishing plans. Such a bummer. Knitting isn't supposed to be a bummer. Maybe I'll work on my vintage velvet. Scarves fit no matter what size you are. Why is that important things fall out my brain but totally inane things remain forever? If you must know my current earworm is Elmo singing about five. And the sand? Dude. I was doing laundry yesterday and I cleaned like half a cup of sand out of my washer. Yes, I live in Florida, but I live like 40 minutes from the beach for goodness sake. Five sweaters. I have five sweaters on the needles. Four of them are nearly done. Not to confused with nearly dead. I'm trying to finish the Sandy Cardigan before the end of year (yes in 15 hours) but of course it won't happen. But if I keep working on it I can wear it this winter. So you wanna hear my crazy (new) ambitious goal? I wanna finish four sweaters in January! I said it was crazy. Sandy Cardigan - halfway through side 2, needs sleeve 2, collar and edging. I honestly think this is doable, plus it would make me feel way better about my pile of wips. Oh wait. You want an update on the goals I made less than a week ago? You're silly. Splash Scarf is no more. Block 6 of the MQW is done and the bag o'yarn is back with Kathe and off my wip list for the near future. Sooper Seekrit had to be frogged. Not enough yarn for the pattern I chose. So there you have it. I'm working on stuff, and I haven't cast on anything new. My official wip count is fourteen. By the end of January I should be down to eight, not counting if I cast on. Which is just awesome. In theory anyway. Yes I know I just did a wip list. But this is a more detailed wip list. With notes and such. For a good purpose. Yes I know you are laughing. I'll wait. Ok, I'll wait some more while you clean the beverage of your choice off your keyboard. I'm sorry I made you spit. I realize of course that even if I knit 24/7 for this last week of the year and gave up sleeping, eating, and potty breaks I *still* would not finish all of these projects. But I can make it better, no? And I can institute firm rules that will get me down to something manageable. Since our last fireside chat, I have finished a few things. Hold your applause until all of our FO's have been announced. Two very pretty ornaments, only one of which I have a picture of. These knit up in no time at all. Swirling Snow, the December washcloth for the Knitwitz Washcloth Club. Are you still here? Wow. So I've finished 8 things in the last month. All of which were tiny. Only 3 of which were on my most recent list. Which is why (shudder) my list has actually gone up an item. I'm now at 20. Yes, I'm hanging my head in shame. 1. Daniel Socks - Not ready for these. Only done a smidge. Will take off the needles and wait for later. 2. Modern Quilt Wrap - I have decided to treat this as 72 mini wips. Each block being a project. I will not "count" the wip unless it is unfinished. Right now I am in the middle of my third block so it's OTN. 3. Oblique - Doing ok on this one, but it's not close enough to finished to merit end of the year attention. 5. Endpaper Mitts - Also low on the priority list. 6. Ice Queen - This might be a contender. 7. Vintage Velvet - Also might be a 2007 winner. 8. Upstream Socks - These fit nicely but I hate the funky way they look off my feet. Does that make any sense? I think these will be purse knitting and not considered an active wip. I plan on making a different architecture for it's mate. 9. Via Diagonale - I would love to have this purse. Need to fit this in soon. 10. Mr. Greenjeans - Guess when the diet starts? This will be a first project to finish in 2008. 11. Scotch Thistle Stole - Also 2008. 12. Sooper Seekrit - Needs to be frogged and redone easier. Not enough yarn for the intended pattern. This is a one movie knit though. Definitely this year. 13. Sandy Cardigan - This will be my 2007 sweater. I'm on sleeve one again finally. 14. Celtic Tote - Back and front done, half of side/bottom combo done. But I ran out of wound yarn. Oh the tragedy. This will be a 2007 knit though too! 15. Juliet - Not sure about this one. Probably spring 2008 for wear in the proper season. 17. Maximize Socks - Nearly done, but I'm taking these off the official list because I have to have a pair in progress for my class. 18. 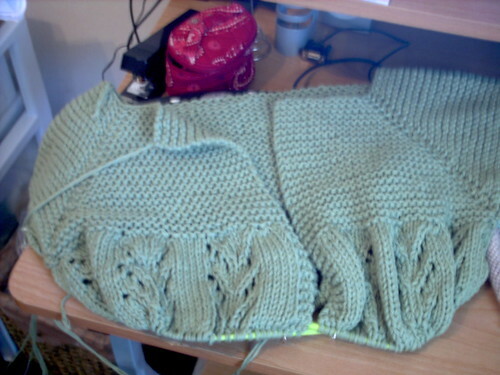 Tomato - I would like to finish this, but the truth is that it's a spring sweater and too small right now. 2008. 19. Icarus - Have I mentioned that this is 85% done? I will not cast on for any more lace until I finish it. 20. Fuzzy Feet - I swear upon everything holy that I will felt these tomorrow. Yes, I have finishing issues. At the end of 2007 I will be down to 11 wips. Eleven. That's my pledge and goal. And I will have a veritable plethora of FOs to show you. Heck I might even handwind some yarn. Ok, probably not the last bit. But the rest for serious. I fall into the hole. The too many wips hole. Too many wips, too many ufos. I think I might have some knitting issues. Poor planning knitting issues. I start things that I never finish. Why is that? Many of the things I seem to never want to finish. You might wanna click away now. Go somewhere happy, that has pictures of puppies or ducklings. Because I'm gonna make a list. 1. Icarus - still the same old place. Maybe I could finish this for Daniel's big party and buy a matching dress! 2. Tomato - fair isle too tight on boobies. So sad. Must lose weight. 3. Maximize Socks - these don't count because they are my sock class socks, right? 4. Splash Scarf - oh sweet niblets! Someone please take that thing out of my house! 5. Big Ole Baby Blanket - finish for December 8th baby shower! 6. Juliet - about half done with the lace. So fast, so easy, so forgotten. 7. Misty Hat - have about five inches. Need about seven before decreases. 8. Sandy Cardigan - would be nice since there have been chilly days. I'm such a slacker. 9. Sooper Seekrit - don't ask! 10. Mr. Greenjeans - stupid belly. See #2. 11. Scotch Thistle Stole - half done. Not dressy enough for party. Not high priority. 12. 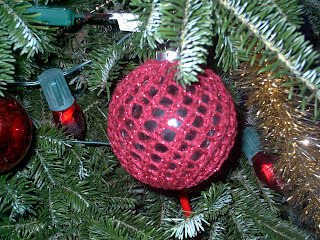 Basket Ornament - I. Hate. Bobbles. 13. Via Diagonale - anybody want this? 14. Upstream Socks - bored now. 15. #19 - For the love of all that is holy I will conquer this one! 16. Celtic Tote - Half done with back. Will be cute. Need to do. 17. Endpaper Mitts - fun in theory. Need motivation in reality. 18. Vintage Velvet - the love of the minute. I've worked nearly one ball of Touch Me. That stuff is sooooo nice. 19. Daniel Socks - Below is the picture of the yarn barf I pulled out looking for the freaking end of the trekking. Just got an IM from my LYSO. The Riverstone is on the way. Caroline is slated up next. Must. Finish. Something. I'm a SAHM who's gone back to school to be a Math teacher. Tell me I'm crazy later. I also knit like crazy and spend too much time at the yarn store.